3. Man Ray's photographs are full of the famous artistic and literary figures of his time, including James Joyce, Constantin Brancusi, Gertrude Stein, Joseph Stella, Jean Cocteau, Pablo Picasso, Ernest Hemingway, Henry Matisse, Marcel Duchamp (as Rrose SÃ©lavy), and Marcel Proust (on his deathbed). 4. 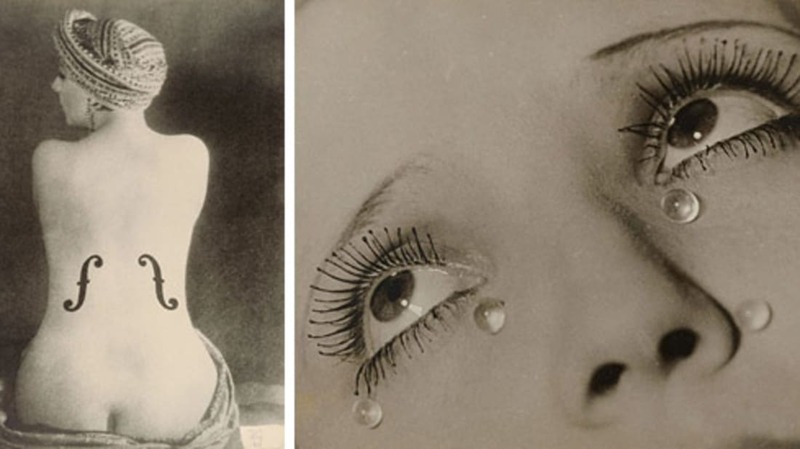 While Man Ray had many lovers over the years, he only married twice. His first marriage only lasted a few years, but his second marriage, to Juliet Browner, lasted a full 30 years. Browner and Man Ray were married in 1946, in a double-wedding with their friends Max Ernst and Dorothea Tanning. They remained together until Man Ray's death in 1976. Larger versions of "Le Violon d'Ingres (Ingres's Violin)" (1924) and "Tears" (1930-1932) are available. Fans should check out the Man Ray Trust; Man Ray Photo; Tate Modern's "Duchamp, Man Ray, Picabia" exhibition; and the collections of Man Ray's work at the George Eastman House, the Getty Museum, the MoMA, and SFMOMA.